Karsh Hagan won the Top Honors for 3 Dimensional Design. Karsh Hagan won 3 Top Honors awards at the 2014 Art Directors Club Denver awards this weekend. The work presented at the awards show was incredible and we were thrilled to be surrounded by so many creative and talented people. KH won the Design: 3 Dimensional award for the wine gift sets we created for Colorado Tourism Office’s Governor’s Tourism Conference. 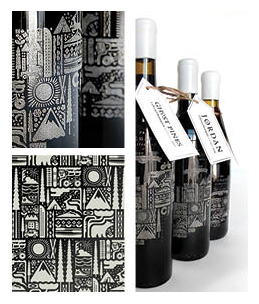 The bottles were laser-etched with an organic pattern using icons that represent the state of Colorado and hand dipped in white wax. KH took home the award for Brand Development for Stoic & Genuine. 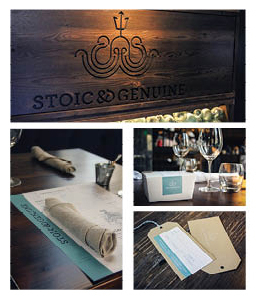 We also took home the Top Honors award for Design: Brand Development for Stoic & Genuine. Inspired by the fresh and modern fare against the historic architecture of Union Station, the identity depicts an octopus wearing the trident as a crown. Both the business cards and gift certificates were inspired by the traditional oyster tag of New England. The last award we accepted was Web Design for the Karsh Hagan website. We restructured our work portfolio to show integrated case studies to help illustrate who we are and how we build our client’ businesses. The rich imagery, video and storytelling reflect how customers experience our clients’ brands across all media. Karsh Hagan won Top Honors for Web Design for KarshHagan.com. KH had a blast at the ADCD Awards show and left feeling inspired. The Art Directors Club Denver is a has been working to foster collaboration and inspiration among existing creatives, elevate local talent and resources, and empower the next generation of creative professionals in Denver since 1955, and we are proud to be a part of it.